DMX bracketed tower. 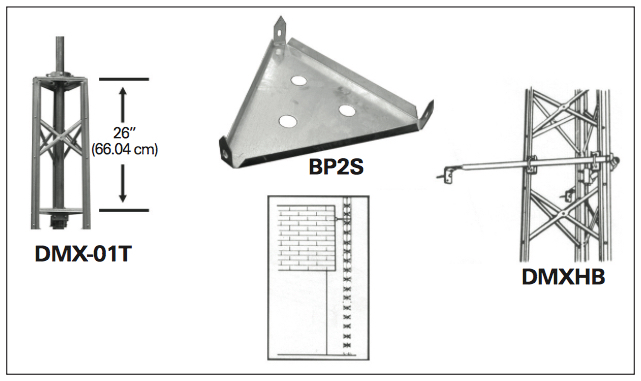 DMXB tower packages come complete with tower sections, DM mast, top plate, rotor plate, BP2S base plate, TMCA mast clamp assembly and DMXHB universal house bracket. Height includes mast. DMXB Towers are designed to support an antenna load of up to 3 square ft. wind area. This is equivalent to one large TV/FM an- tenna or two medium size TV/FM antennas, or one small VHF col- linear or one small CB antenna. No more than 20 ft. of tower (2.5 sections) should be above the house bracket. Guy wires must be used if larger loads or greater height using more sections is needed. Use GS12 listed below. Caution: Guy wires must be used for larger loads or greater heights above house bracket. Galvanized steel drive stakes. Set of three.